Happy Labour Day everyone! I might be stuck at work on the long weekend but that won’t stop me from bringing you your daily dose of Team Stryker! Today’s page was meant to showcase how deadly Deadeye is, even when pitted against his own team mates. It’s also meant to show how DE has respect for Eagleheart and his lack of respect for Casanova and V-Scope. Eagleheart and Deadeye have been brothers in arms long before the formation of Team Stryker and that makes it harder for Deadeye to want to harm Eagleheart. 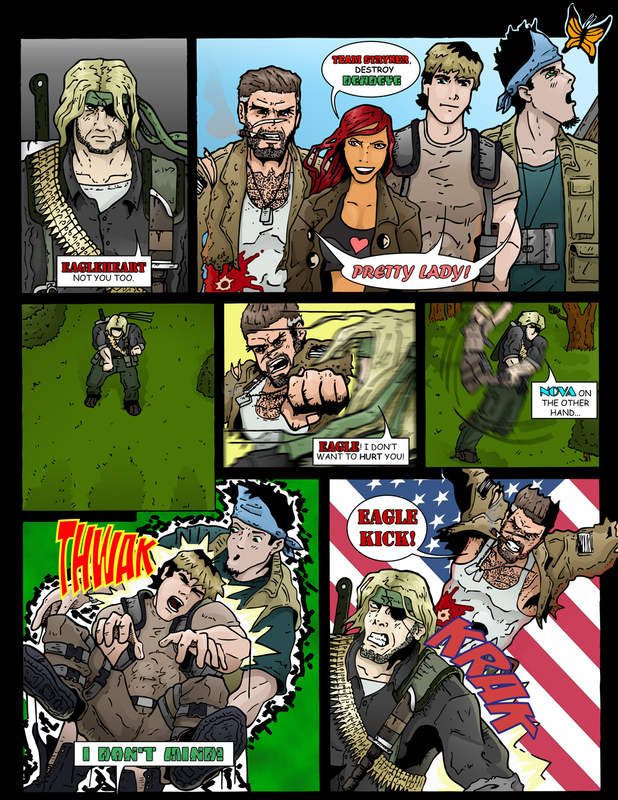 Casanova and V-Scope are the younger members and have a lot to learn about surviving the wrath of Deadeye. I hope everyone has a fantastic day off and don’t forget to follow Team Stryker on Twitter and Facebook as I’ll be having some exciting new announcements in the near future! Cool blur effect, Andrew. Yeah, ‘Nova needed a good beating! Pages are loading faster so something’s working well!